It is generally true that the further towards the back of the grid an F1 team is, the more friendly it is towards its fans. Renault are trying to make a difference but it may not be entirely coincidental that, as they become friendlier, the performance of their cars tends to slip and they drift away from the leaders. Perhaps there are good reasons why the top teams behave as though the fans are a necessary irritant rather than a valuable asset. In line with my hypothesis, however, Spyker are about as user-friendly as it gets. And a large part of that is the free online magazine they publish after every race. If you haven't registered for your copy, I recommend that you do - it's a great addition to any F1 fan's armory. 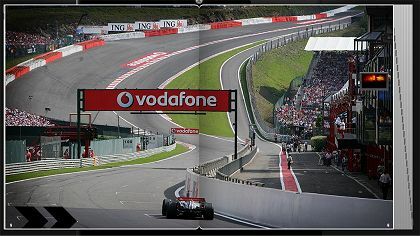 Naturally, the magazine has a heavily Dutch and Spyker emphasis but there is plenty of more general F1 information. The quality of photography is excellent and there are always informative videos and articles included. As an insight into the Spyker team, it is essential but it is also highly entertaining even if you support another. As an instance, I have seen very few photographs that show the daunting aspect of Eau Rouge as the one above does. I have reduced it in size to fit this page but as printed in the magazine it is truly awesome. 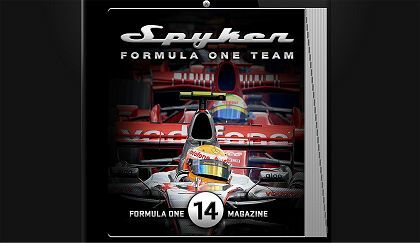 And the photographs cover all the teams, not just Spyker. Think of it as a Formula One magazine with a Spyker interest and you have the picture. To register for the magazine, go to: the Spyker Magazine website. Thanks for bringing this to my attention Clive, I had no idea it even existed! The photography is excellent, Spyker should be congratulated on producing such a superb magazine. Something like this should be mentioned on ITV instead of banging on about how great Lewis is week after week! It's great, isn't it, Craig? And I must thank you for pointing out David Coulthard's blog to me - another must-read for F1 nuts. What a beautifully put together magazine Spyker have put together there. I agree with Craig regarding Spyker being congratulated... fantastic production. And thanks Clive for bringing it to my attention. Sorry about that, Deep - I should have provided a link. Here ya go! There are two more thing I have to mention with regard to Spyker Magazine - it's free and doesn't require membership of any fan clubs (just a registration to confirm e-mail address and basic details). Free good stuff is difficult to come by. The only fly in the ointment for me is that I can't get the magazine. I've been trying to register for it since the start of the season. Basically, when I try to register, the site says I haven't registered, but when I go to register, the site says I already have. It's a pity, because most of my friends on the sf1o.com forum have been telling me that it is a very good magazine (despite initial scepticism and some arguments as to whether the process was in line with the Data Protection Act). Of course, ITV can't mention this magazine, as it is in competition with the itv-f1 site (not that itv-f1 has a magazine attached to their site, but a conflict of interest nonetheless). They can get away with most books, since ITV only does annuals and skinny preview books. You, of all people, should have access to the magazine, Alianora. If you like, I'll let you have my login details and you can have a look. Just throw an email at me - clive.allen@gmail.com. Thank you for the link Clive, I am looking forward to looking through that a little later this evening. I hope that the Orange India consortium see the wisdom in continuing this magazine in its present form. With better marketing, it would make a really good platform to advertise itself among the new generation that F1 wants to attract. I thought you would enjoy the magazine, Alianora; in fact, I was quite surprised that you hadn't been able to register for it. A truly excellent product and a great advert for the team. One can only hope that the new owners see the wisdom of carrying it on, just as you say.